In the time of the earliest settlers in the Washington Territory, women did not have the right to vote. In 1854, Washington nearly became the first state to grant women's suffrage, but the proposal was defeated by a single vote. In an attempt to crush the woman's suffrage movement, the Territorial Legislature soon after mandated that "no female shall have the right of ballot or vote." In 1871, Susan B. Anthony and Abigail Scott Duniway led a crusade through the territories of Washington and Oregon and helped to form the Washington Woman Suffrage Association. Due to the group's constant protesting and pushing, full voting rights were given to women in 1883 by a bill that passed through the Territorial Legislature. But in 1887, the Territorial Supreme Court overturned that law. Another was passed in 1888, but was also overturned. This happened because women voters were making sales of liquor more difficult with their votes, and the state's liquor lobby had fought hard to remove their voting rights. 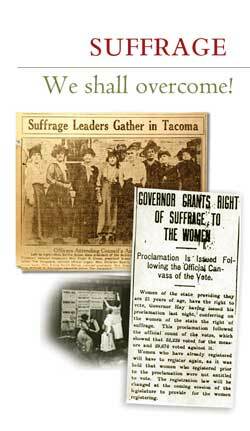 In light of this opposition, some activists chose to emphasize the contributions of women workers to the community and finally, in 1910, the Washington State Constitution was permanently amended to grant women the right to vote. It would be ten years before the rest of the country's women had that right.